Over the past ninety plus years, the BSA has utilized several different organizational structures for councils and lodges. In 1938, lodges were grouped first into fifteen, then eventually twenty-six areas. When the OA became fully integrated into the BSA in 1948, lodges were reorganized as part of the Twelve Scouting Regions. The 1973 New Section Operation realigned lodges into areas and sections among the Six Regions. In 1992, the Six Regions were consolidated into four. The East Central and the eastern half of the North Central Region was merged to create the Central Region, while the western half of the North Central Region merged into the Western Region. 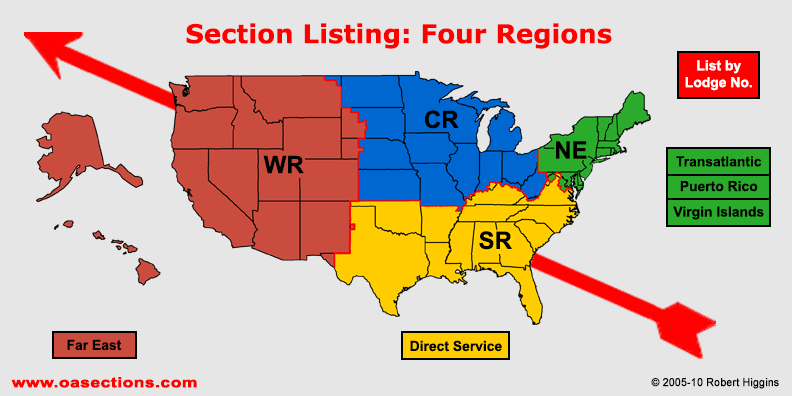 The Southeast and South Central Regions were combined to create the Southern Region. The Northeast Region's seven areas were reorganized into five; however, its boundaries remained unchanged. Featured in "How a Web Site Can Help Your Lodge"
Copyright © 1996-2019 by Robert Higgins. All rights reserved.